My favourite is meeting Dhandi,my Indonesian friend in an auction.We became friends and we have been talking even since!He is so nice and we laugh together.I'll never forget when we first met in real life! Do you remember when we had complete themes to decorate with? Good times. Come Visit Studio 54, THE HOTTEST YoWorld Club to date! Bar, Lounge, and Dance Floor... Drink... Dance... Romance! CLICK THE URL TO VISIT! 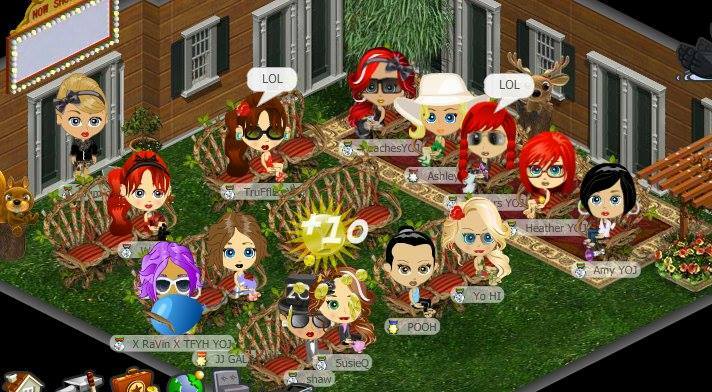 On this day February 2011.... yes that is 7 years ago... we thought we were so cute, as we got together to make points, leveling-up simply cause we got together. Another big memory were the Uber dance parties. Once at altons a few players did a uber flash mob. It was pretty cool. That is huge! Hope he never gets hungry!